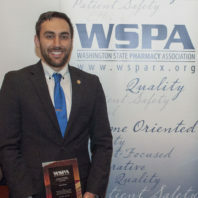 SPOKANE, Wash.—Washington State University student pharmacist David Bunch received the 2018 Pharmacy Student of the Year Award from the Washington State Pharmacy Association (WSPA). Bunch received the award on November 10, during the WSPA Annual Meeting in Stevenson, Washington. He was recognized for his consistent, sustained and outstanding contributions toward fostering student pharmacist participation in association activities on both a local and state level. Bunch is passionate about patient care and advancing the profession of pharmacy through advocacy. He has served as the WSU liaison to the WSPA Board of Directors, American Pharmacists Association Academy of Student Pharmacists (APhA-ASP) chapter policy vice-president, APhA-ASP regional delegate, and as a member on multiple committees. Bunch is currently serving on the APhA-ASP National Policy Standing Committee and is a student representative for the WSPA Ambulatory Care Academy. Bunch is from Oak Harbor, Washington. He completed his undergraduate coursework at Whitworth University and is in his final year of pharmacy school at WSU in Spokane. After graduation he plans to pursue a residency and continue his involvement in pharmacy associations.